ISTiOSELIDA - Sailing ONLY: Sailors Night Vision Cap: More free Hands! Sailors Night Vision Cap: More free Hands! Στην κατηγορία που ξεκινήσαμε τις προάλλες και που θα παρουσιάζει εταιρίες, προϊόντα και υπηρεσίες του χώρου μας, σήμερα έχουμε ένα προϊόν που θα σας λύσει στην κυριολεξία τα χέρια. Το Sailors Night Vision Cap, είναι μια απλή εφαρμογή δίνει στους ιστιοπλόους αυτό που τις περισσότερες φορές χρειάζονται... επιπλέον ελεύθερα "χέρια" για δουλειά. Αν κάνετε ιστιοπλοΐα το βράδυ ή απλώς κάνετε κάποια εργασία στο σκάφος σας και είτε είναι βράδυ, είτε χρειάζεστε και τα δυο σας χέρια το Sailors Night Vision Cap σας δίνει τη λύση. Διαβάστε παρακάτω αναλυτικά τις λειτουργίες και τα χαρακτηριστικά του προϊόντος. (2) red LEDs have an on/off button. Three position switch options provide for improved functionality (high beam only, low beam only or both on simultaneously for (3) white LEDs. When you are navigating in the dark on the water, it is critical to maintain your night vision. The red LEDs provide task lighting while maintaining night vision. We have incorporated the (2) red LEDs under the cap brim. They are angled downwards to light up your task lighting area without having to crane our head and neck down. There are also (2) white lights under the cap brim that are useful for task lighting in circumstances below deck. A powerful (1) LED light on the cap brim can project over 60 ft. Very useful for Sail trim checks, deck clearing or spotting buoys. All these lighting needs are taken care of with a simple button in the cap brim. Sailors are taught to carry two flashlights. That way the Crew will always have a backup. 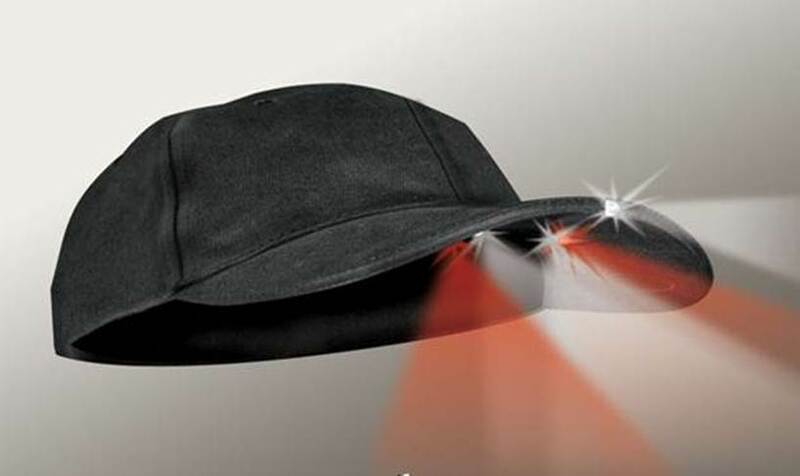 The POWERCAP™ Night Vision Cap fulfills this requirement as the two lighting circuits are separately powered and switched in one fashionable and convenient cap. Best of all, the lighting is hands free. The circuits are sealed and weatherproof to the elements. The caps visor is also great for boating in bright sun light conditions. 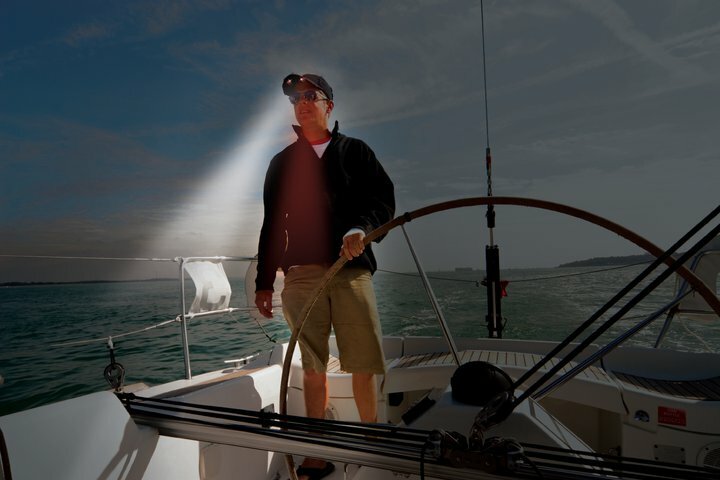 This Pilot Series POWERCAP™ Night Vision Cap provides the day and night needs of any boater for shade cover during the day and night vision in a simple cap. It can be decorated just like ordinary caps. Embroidered with your boat logo, yacht club, organization, company, anything. New Patent Pending C.U.B. (Concealed Under Brim) Lighting Technology positions the light where you need it most – where your hands and feet are at work or play. C.U.B. lighting will not blind other people that you interact with while using the POWERCAP™. POWERCAP™ 2 + 1 Design provides “Low Beam” and “High Beam” lighting options. The (3) LED’s put out as much light as our (4) LED caps but with more functionality and longer run time. (2) Under Brim LED’s for Close Up lighting (Reading, Hobbies, Home Repair and seeing where your feet are stepping.) This is the standard configuration for our POWERCAP™ Night Vision Cap. (1) Ultra Bright 25,000+ MCD “Spot Light” provides longer distance lighting for Walking in the Woods, Running, Biking, Hiking, etc. where longer lighting is needed. More than double the battery life (up to 75 hours of battery life). The (3) LED POWERCAP™ uses (4) CR-2032 lithium coin cell batteries. Batteries are easily changed with our new enclosed pack with slide off door. (5) LED Performance Series POWERCAP™ adds colored lighting options in the C.U.B. position (one white spot light in center edge of brim, two white LEDs along with two colored LEDs below the brim) for night vision and other applications. Order through www.SailorsNightVisionCap.com Shipped next day from Stamford, CT. Presently All caps are produced in Black. Min order of 1008 needed for additional color change for cap.